Hong Kong Disneyland opens two shops at the Hong Kong International Airport to sell thousands of souvenirs with the theme of Hong Kong Disneyland (which is scheduled to open September 12). Pearl) inspired the 1941 Disney classic Dumbo. The Mickey Mouse short Mickey's Steam Roller, directed by David Hand, is released. While worker Mickey romances Minnie, Mickey's nephews Morty and Ferdy take his steamroller on a very destructive ride. Walt Disney & Marcellite Garner provide the voices for Mickey & Minnie. world premiere in Chicago. It is the first Disney cartoon feature filmed in CinemaScope (a wide screen film process). It will be generally released 6 days later. Disney also releases the third People and Places film Switzerland. Theater, and the Storybook Land Canal Boats attraction in Fantasyland. which is piloted by a Disneyland Cast Member. includes the animated shorts Melody and Working for Peanuts all in 3D. by outboard motors) afloat in 465,000 gallons of water. Walt Disney purchases the film rights to the Winnie-the-Pooh stories from Mrs.
Aerial photographs of a location east of the Hollywood Bowl in California are shot for Walt Disney. He is forming the new CalArts college and a plot of land has been suggested for the campus. New Mickey Mouse Club, is born in Los Angeles, California. between the 1930s and 1970s, he helped NASA land men on the moon in 1969. The Disney Channel airs episode 40 of MMC. Today is Hall of Fame Day! Reflections on Ice: Michelle Kwan Skates to the Music of Disney's Mulan airs on ABC-TV. Totally Circus (a documentary/adventure series) premieres on the Disney Channel. & Stitch takes place at the El Capitan Theatre in Hollywood. Among the guests in attendance for the event are actors Jason Scott Lee (the voice of David Kawena), David Ogden Stiers (the voice of Jumba), Kevin McDonald (the voice of Pleakley), and country singer Wynonna Judd (who performs the Elvis Presley song "Burning Love" on the film's soundtrack). The Pyewacket (a vessel owned by the Disney Corporation and skippered by Roy Disney) wins the Newport to Bermuda Yacht race. The yacht breaks the record by 3 hours, 52 minutes, and 22 seconds; crossing in 53 hours, 39 minutes, and 22 seconds. Count Basie and his orchestra perform at Disneyland for the first of a six-day engagement. destroying the world. The film will draw 5.7 million viewers on this evening. The Hannah Montana episode "Take This Job and Love It"
The Power of BLAST! debuts at Epcot's America Gardens Theatre. The show will run through August. The 3D film Magic Journeys begins its 2-year run in Disneyland's Tomorrowland. 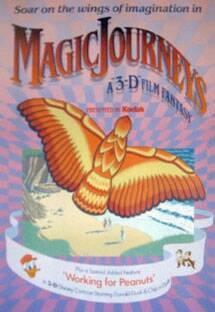 The first 3D movie created by Walt Disney Imagineering for a Disney theme park, it first opened at EPCOT in 1982. Featuring the song "Makin' Memories," the 70MM Magic Journeys looks at the world through the eyes of a child. "Elvis Presley was a model citizen. I've compiled a list of his traits for you to practice. Walt Disney Studios Home Entertainment releases Morning Light, a documentary about a group of intrepid and determined young men and women who race a high-performance 52-foot sloop in the TRANSPAC, the most revered of open-ocean sailing competitions. Disneyland Grad Nite '67 takes place for the second time this season. Disneyland Grad Nite '66 is held for the first of two evenings, from 11PM til 5AM. Philbin, Jack and Bonita Wrather, Anika Noni Rose, Lea Salonga, Ray Watson and Guy Williams. Schuster Performing Arts Center in Dayton, Ohio. officially opens. The park is operated by Walt Disney Parks and Resorts and Shanghai Shendi Group. Battle for the Sunken Treasure, Voyage to the Crystal Grotto, Roaring Rapids, and Buzz Lightyear Planet Rescue. generation of blazing-fast cars, the legendary Lighting McQueen finds himself pushed out of the sport that he loves. and the unseen monster within. Lou will be nominated for Best Animated Short Film at the 90th Academy Awards. (of what will be 14) in the series. Also released is the Inside Out Soundtrack, with music by Michael Giacchino (his fifth collaboration with Pixar as a composer).